What you didn’t realize is you were digging a well. In days gone by, wells were dug by hand and not machine. It was hard work. It was straight down. The deeper the shaft, the greater the strength of the well and its ability to to bring water even in seasons of drought. It was a long arduous process of digging, hauling out the soil with buckets and digging more. It required breaking up of the dry soil and rocks they encountered to get to the sweet water that would sustain them through dry seasons. But they had to get to it first. I’m sure it would have been tempting to dig a shallow well of just nine to ten feet…because in most situations they could reach water at that stage. But shallow wells are more susceptible to contamination. In addition, in times of drought, they will go dry. It’s tempting when we hit those hard places to dig shallow as well. Sometimes we only want to dig far enough to get out of the pain and the rockiness of the situation. But when we don’t dig deep, it can’t sustain us. A good strong well in earlier days was 60-100 feet or more. Can you imagine doing that by hand? Yet, when the work was done, the place that required some of the hardest work of their lives and the greatest challenge, became a life source of refreshing. That is the word the Lord is speaking right now. 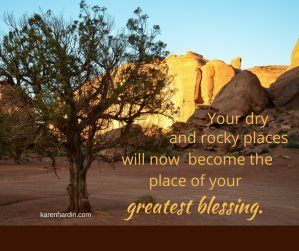 Those dry and rocky places are an opportunity to dig your well. Dig down deep in Him for He is transforming them to be your greatest blessing. Don’t just go shallow. Dig deep until you hit the sweet waters of refreshing of His Spirit. The word washes us and washes away the hardness and dryness and brings new life. And what was once your greatest source of pain, He is transforming to a deep well of refreshing and blessing. The scripture says, that we are made holy and are cleansed by the washing with water through the word (Ephesians 5:26). So dig deep! Let the word refesh you and speak to you. He said, “I will instruct you and teach you in the way you should go. I will guide you with my eye upon you” (Psalm 32:8). Dig through those rocky places of pain until you hit the water of life to wash them clean and transform what once was a great disappointment into a place of great blessing! If this word ministered to you, please let me know in the comments!